International marketing is the application of marketing principles by industries in one or more than one countries around the world. It is Very possible for companies to conduct business in almost any country around the world, thanks to the advancement in international marketing system. In simple words, international marketing is trading of goods and services among different countries. The procedure of planning and executing the rates, promotion and distribution of products and services is the same worldwide. In recent times, companies are not restricted to their national borders, but are open for international marketing. With the increasing change in customers’ demands, choices, preferences and tastes, the economies are expanding and giving way to more competitive marketing. Thus, organizations need to respond rapidly to the demands of the customers with well-defined marketing strategies. The word ‘International Marketing’ is defined as the exchange of goods and services across national borders to meet the requirements of the customers. It includes customer analysis in foreign countries and identifying the target market. 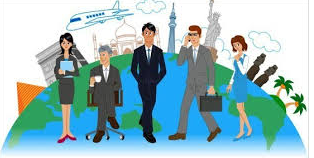 Multinational Corporations (MNCs): A multinational corporation (MNC) is an organization that ensures the production of goods and services in one or more countries other than its home country. Such organizations have their offices, help desks or industrial set-up across nations and usually have a centralized head office where they co-ordinate global management. Exporters: They are the overseas sellers who sell products, and provide services across their home country by following the necessary jurisdiction. Importers: They are the overseas buyers who buy products and services from exporters by complying with the jurisdiction. An import by one nation is an export from the other nation. Service companies: A service company generates revenue by trading on services and not on physical commodities. A public accounting company is the best example of a service company. Revenue here is generated by preparing returns of income tax, performing audit services, and by maintaining financial records. Many companies believe that their targets are limited if they only concentrate on a single market like the U.S. Market and Global marketplace is competitive. Thus, to enrich their market presence such companies are always on a lookout for better opportunities worldwide. International Marketing System is the practice of marketing principles by industries in one or more than one country across the national borders can participate. This is a brief introductory post that explains the basic concepts, strategies and challenges included in International Marketing.